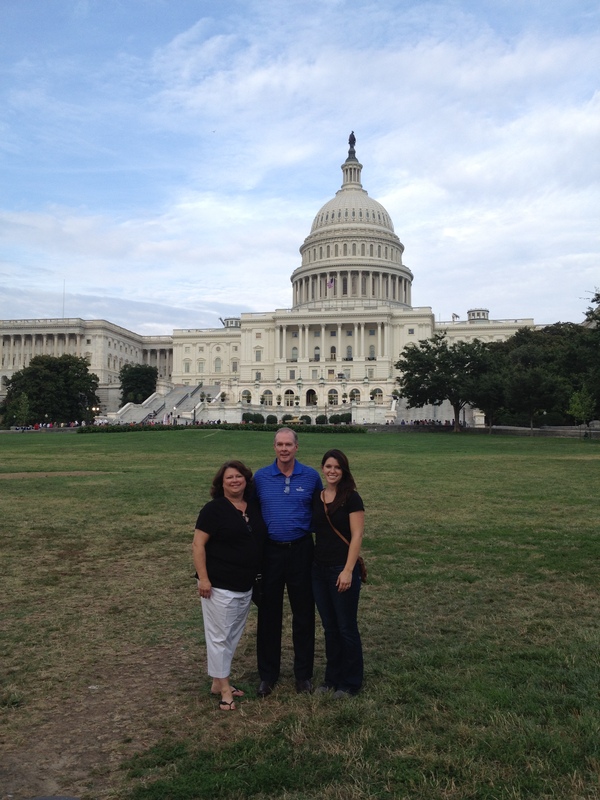 Mark, Kim and Emily Leazer in front of the Capitol. If there is one thing that most uniquely sums up this year’s ABC 2012 conference hosted by SP Richards, it would without a doubt be patriotism. With this year’s event held just outside of Washington, D.C. at the enormous and impressive Gaylord National, the size and grandeur of which is uniquely American, the location alone was the quintessential representation of our nation. As the week progressed the theme of the conference, Independent’s Day, (a clever play on small, independent businesses and America’s birthday) manifested itself at every turn from the opening celebration complete with carnival games, a walking statue of liberty and an enchanting fireworks display over the Potomac river to the closing gala on Saturday night where attendees were serenaded with a range of American themed songs by a talented group of singers. Sure, the use of patriotic messaging was used to play on our heartstrings and captivate the audience. But, there was a deeper message at play here too. We’ve seen better economic times and our industry is facing a whole new set of obstacles in a world saturated with online retail and big box chains. However, if you look back on history, every generation has faced a great challenge that had to be overcome. In fact, compared to some of those challenges encountered by our grandparents and great grandparents, our problems are much more manageable. Fortunately for us, that is one of the characteristics of Americans, particularly the small, private business owners and employees, that has allowed this nation to succeed; hard work, determination and the resolve to not bow in the face of adversity. Now I’m aware that this article is starting to show signs of being a propaganda piece for American prosperity. But the point remains, if we hold on to, or at least renew, those values of hard work and resilience, we stand an infinitely greater chance of success. So you may be wondering, did you get anything out of the conference other than a hearty dose of patriotism? The answer is a resounding yes! A variety of impressive and knowledgeable speakers including Sam Richter, Mark Slatin and Stephen Little, to name a few, provided tangible and useful ideas for us to bring back to our businesses. The seminars covered a range of topics from leadership structure to social media to buy local campaigns. Perhaps just as valuable as the seminars and sessions was the opportunity to meet and network with individuals from around the country representing the independent office supplies industry in every shape and size. Though our company size and business models vary significantly, it’s amazing how much common ground we find when discussing day to day issues we all face. While I readily admit that the dinner parties and tours around the capital made the trip quite entertaining, I can honestly say that I feel like I gained a great deal of valuable knowledge at this conference. I walked into the office this morning with an air of excitement and energy to get to work on some of the things I learned last week. Of course, the true test of the success of this year’s ABC 2012 will come a few months down the road when we can more accurately measure what impact this conference had on our business. Here’s hoping for great things to come! Previous Post: Have you volunteered lately? Impressive writing… Enjoyed the article…. :~) Here is kudos to Chaple Hill!